For anyone interested in the car I have also filmed several videos of a close up walk around of the car, underneath etc so you can have a good look in detail. If anyone is interested Please message me on 07793218502 and I will WhatsApp you the video. Regards Paul. Hi Rednop1, did you mean LSD, if so then Yes, it is fitted with a quaiffe ATB, the diff is a Ford 3.36 ratio. Hi Michael, my Megablade will be up for sale in the spring, it’s an 2001 893cc factory built model with a great specification! 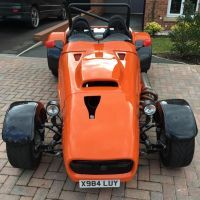 Unfortunately no reverse box but other great bits such as full caged Roll cage, quaiffe ATB, 4 Pot Westfield front callipers and AB performance bits! And it’s only covered 10,000 miles since new! Im looking for approx 9k though so let me know if you’d like further details. kind regards Paul. New MOT rules any one thought of doing this? As long as the work undertaken (ie the MOT) is paid for, regardless of pass or fail the garage has no power to seize or retain possession of your vehicle. As I understood it you would be free to remove your vehicle, if you were prevented from doing so then the garage may be committing criminal offences. If you theoretically decided to drive the vehicle away in a dangerous condition then you would commit a traffic offence, but not an issue if you trailer it etc. Maybe it’s worth considering whether a reverse gear is essential? I’ve had my Megablade for two years and have managed without...and it’s mostly used on the roads rather than track, you just have to think ahead when parking. I’ve only been caught out once when parking on an incline at Oulton Park...it wasn’t until I went to reverse out that I remembered, thankfully another person assisted with the push! As they are very light cars it’s easy enough to push if you need and keeps the drivetrain nice and simple with fewer parts to go wrong! Saves a little bit of weight too which is important on A BEC. Paul. Good luck with the new car! I’m sure you’ll love it! Like others have suggested you’re probably better getting someone to take you down, then you can drive the car back and give it a good run! I drove from Cheshire to Worcester to collect mine and my dad followed me home! You can sort out your insurance when you get there....it was a cold February day when I picked mine up...but fortunately no rain!